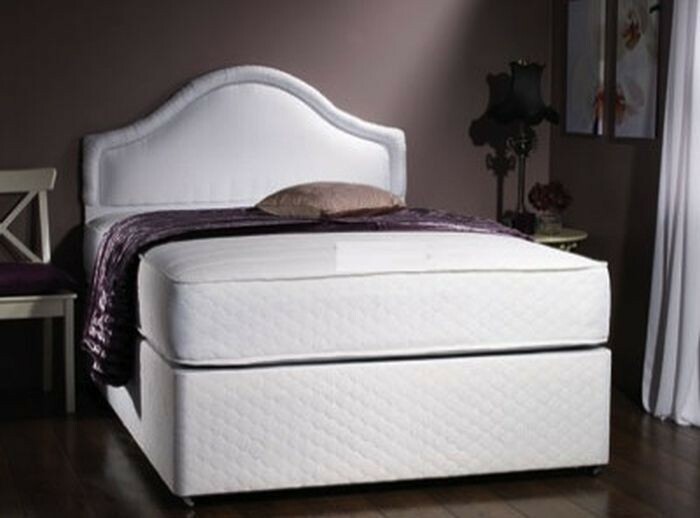 The Milan 4ft small Double Divan Bed in White Quilted Damask, comes with a 1500 Pocket Sprung Memory Foam Luxury Mattress. It is constructed around a 1500 count pocket sprung unit with ultra-supportive layers of 5cm high density visco elastic memory foam to distribute pressure evenly and to provide ultimate comfort and support. Each Spring is sewn into an individual fabric pocket allowing it to move independently and respond to the body's every movement and contour. It provides the best possible support to your spine allowing your body to immediately find the best sleeping position, reducing tossing and turning. The extraordinary features of this Mattress helps blood to flow and circulate freely, preventing the nerves and muscles from numbing. The mattress features air vents which allow air to circulate through the mattress and increase freshness and cleanliness.They also prevent excess heat and moisture giving the body a greater relaxed state and increased comfort. It is upholstered with layers of hypoallergenic cotton and polyester fillings.This allows for an even distribution of weight and gives a fantastic support for the body and a relaxing sleep. Mattress firmness rating = MEDIUM. The Milan bed is available with a Platform top Base for firmer support or a Sprung Base for a softer more luxurious feel. The divan base is made from solid timber to provide a comfortable, sturdy, sleeping platform. The Divan Base mostly comes in two horizontal split halves, but when you purchase it with side slide storage, the divan base comes in two vertical split halves. Also comes with easy glide castors and attachments for the headboard. There is also a wide range of storage options to choose from. You can buy this divan bed with standard side drawers approx each 32" long drawer, Jumbo side drawers approx each 47.5" long drawer, Large full length side drawers, Continental drawers approx each 16" long drawer and slide storage options. The RH side or the LH side for the storage are from standing at footend of the bed and looking towards the headboard.So ideally, if you require right hand side storage looking from footend of the bed towards the headboard end, you need to select the Right Hand Side option.